You are here: Home / Blog / Ireland / So how big was he, really? So how big was he, really? I’m a fan of tall tales, stories that require a huge leap of faith were one to take them literally. I like legends of all kinds, prefaced with the ubiquitous ‘it is said…’, attributable to no one but the speaker’s imagination. Were I to believe the chap that showed us around the Giant’s Causeway a couple of weeks ago, its maker, Fionn MacCumhaill (Finn McCool) was 54 foot tall, in his bare feet. For years and years he lived on the Antrim Coast with his wife Oonagh (his first wife, Sadhbh had been turned into a deer after giving birth to their son Óisín – fair play though, he did look for her for seven years before giving up on her). 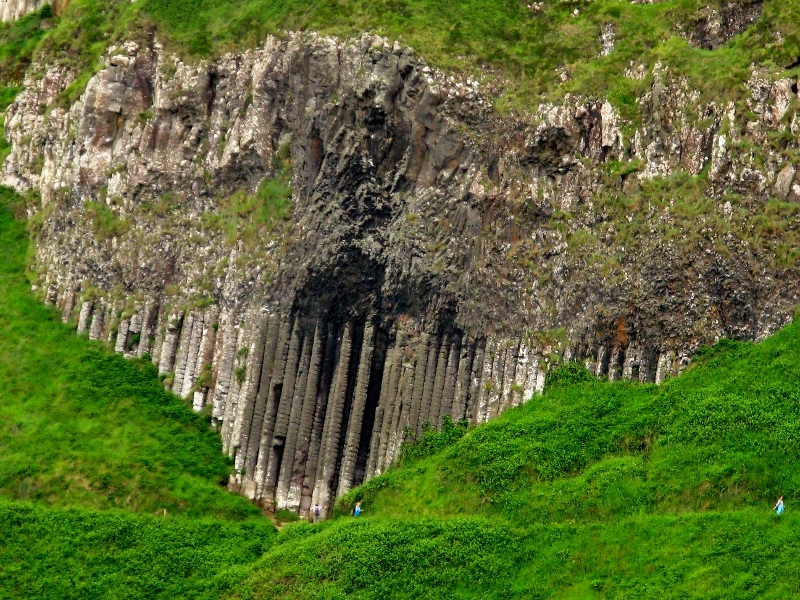 All was well until he discovered that another giant of a man lived across the water in Scotland. The two got into a slagging match and the bould Fionn lost his temper. He grabbed up a sod of earth and flung it across at his nemesis, Benandonner. It fell short and is now known as the Isle of Man. Interestingly, if you get out your map, you’ll see that the shape of the Isle fits neatly into Lough Neagh. 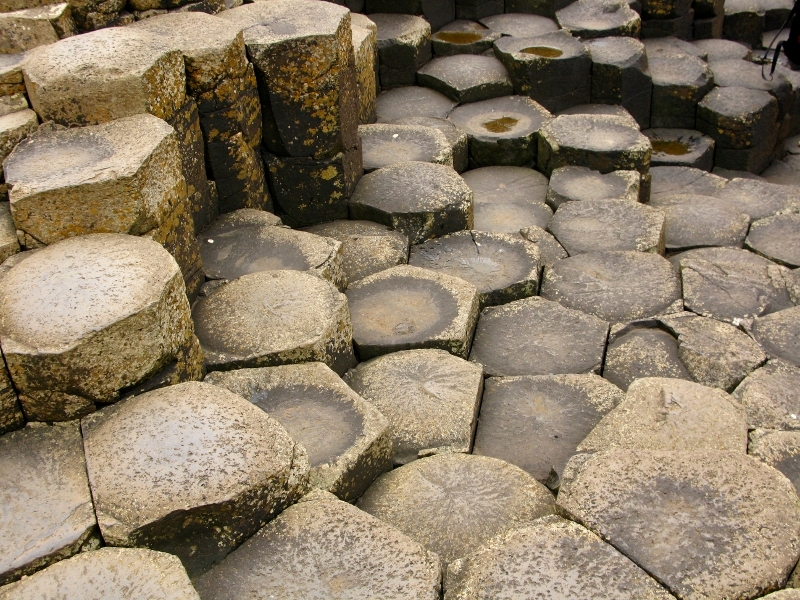 Not to be bested, Fionn challenged yer man to a fight but rather that get his feet wet, he built the causeway – a series of massive stepping stones – to bridge the gap between Ireland and Scotland. But it turns out that Benandonner was even bigger than Fionn, big enough to make my Irish hero turn and run home to his missus. 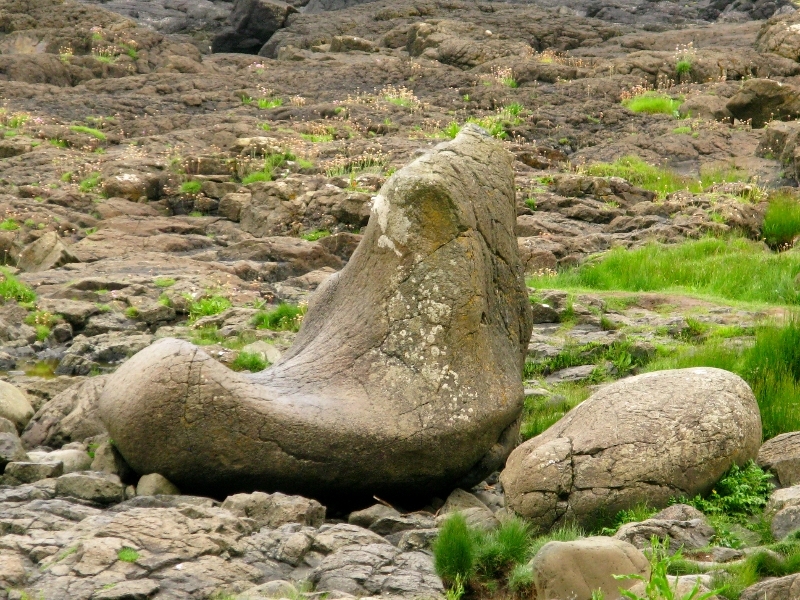 He was in such a hurry that he lost his boot, which over the years has turned into stone and sits today in Port Noffer. To lend weight to this story, the shoe scientists were called in (or so our guide swears). Given that you can apparently predict the height of a person by their shoe size, 54 feet is quite accurate. Benandonner set off in pursuit but when he arrived at Fionn’s all he met was Oonagh and her baby. The fast-thinking wife had hidden her husband in plain view, dressing him up as a baby, sticking him in a cradle, and asking the visiting giant to be quiet lest he wake the child. Benandonner’s imagination ran riot when he began to think of the size of a man who could sire a 54-foot baby. He didn’t stay for tea. On his way home, he ripped out the stepping stones, just in case Fionn had second thoughts. I’d heard a variation on this theme used to explain why the Romans never invaded Ireland. Apparently they got as close as the west coast and when they saw the women collecting seaweed, they figured that if Irish men were half as tough as their women looked, they’d be best left alone. 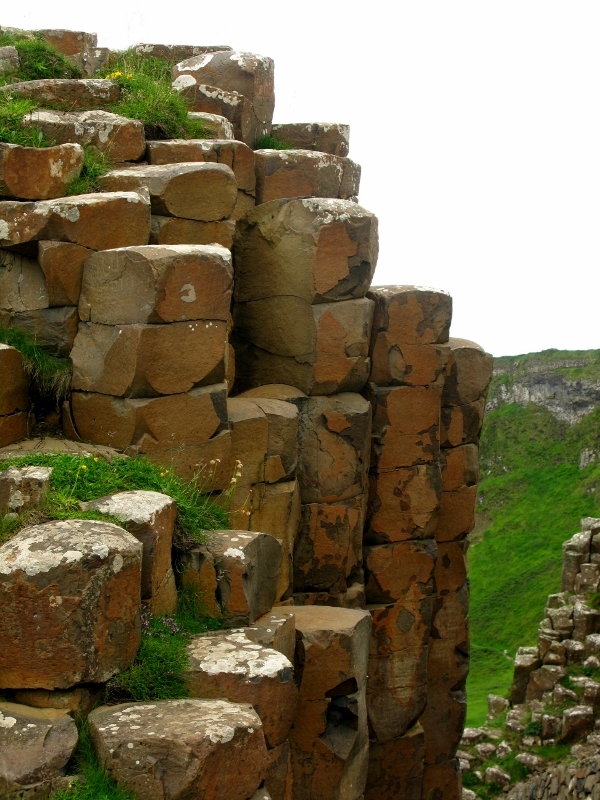 Whatever your taste in stories, however limited or unlimited your imagination, there’s something magical about the Giant’s Causeway. 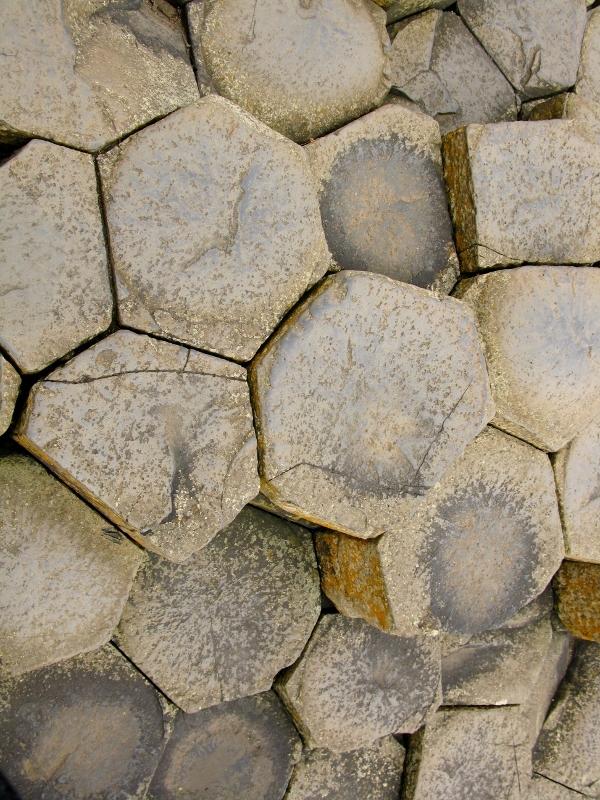 The hexagonal-shaped rocks (about 40 000 all told) sit neatly together as if painstakingly placed by an avid jigsaw enthusiast. It’s quite amazing. The first time I visited 20 years ago, I was disappointed. I had expected everything to be … well… bigger, as would befit a 54-foot giant. This time, I was pleasantly surprised. Perhaps because we took the tour rather than tried to make sense of it all on our own. As you walk towards the water, you can see what looks like a massive stone organ pipes in the distance. 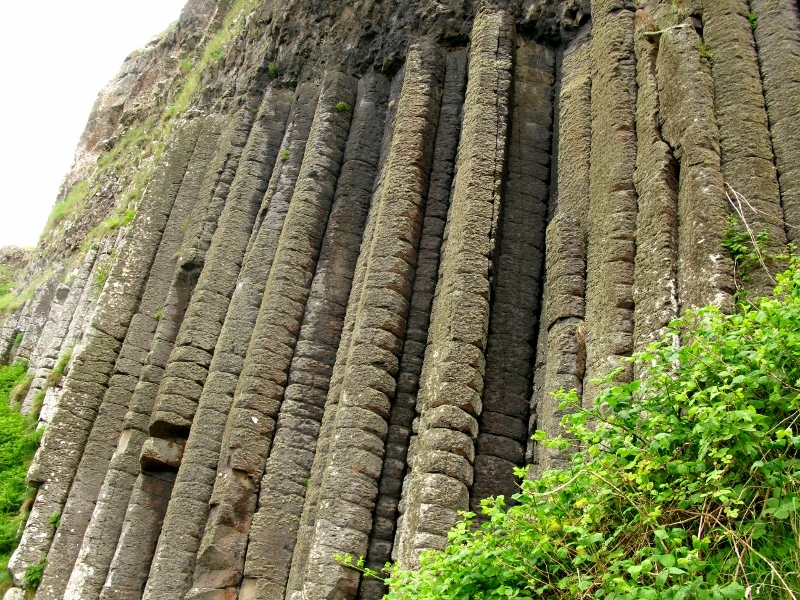 These pillars look like they’re some sort of giant stalactites but up close, they too are interconnected. I’m sure there is some sound geological explanation for these rock formations, but quite frankly, I wasn’t all that interested. I much preferred the legends that went with them. There’s a wishing seat tucked in among the stones on one of the peaks. It’s said that a South American football team came here to play some international competition. They each took a turn on the chair and wished for a win. And they won. They came back again four years later, wished again, and won again. I didn’t need an invitation. The key to it, I was told, is to wiggle your bum to shine the stone as you close your eyes and wish for your whatevers. I’ll keep you posted. https://unpackingmybottomdrawer.com/wp-content/uploads/2017/06/logo-300x82.png 0 0 Mary Murphy https://unpackingmybottomdrawer.com/wp-content/uploads/2017/06/logo-300x82.png Mary Murphy2014-07-02 21:57:382016-11-26 18:05:13So how big was he, really? 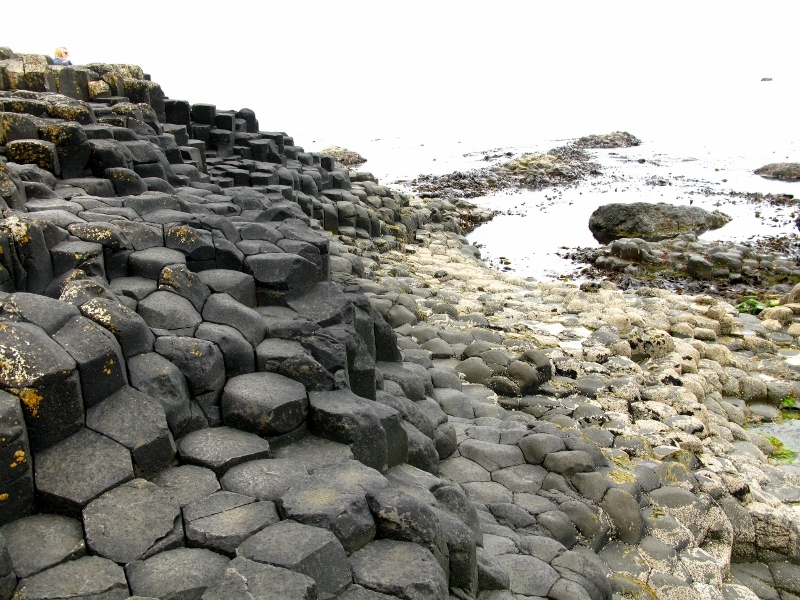 Some pictures that you see of the causeway seem to suggest that it is fairly small (as your first trip suggests)……….about how large an area is it………a football pitch?